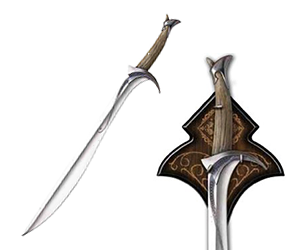 To all the LOTR/Hobbit admirers and avid sword collectors – you have the chance to own an exceptional replica of the ancient elven sword called Orcrist, the one Thorin Oakenshield found in a deserted troll cave! The sword is large and feels like the real weapon that it is. It’s nothing like other cheap quality replicas, for its blade is made of AUS-6 stainless steel and the handle is crafted from Acrylic resin and covered with wood.